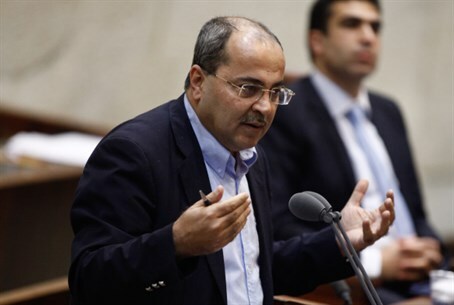 Arab MK Ahmed Tibi on Monday fired back at Foreign Minister Avigdor Liberman, who on Sunday had advocated “cutting of the heads” of Arabs who were not loyal to Israel. “Those who are with us deserve everything, but those who are against us deserve to have their heads chopped off with an axe,” Liberman said at an election event Sunday. Responding Monday to Liberman’s comments, Tibi said that the Yisrael Beytenu chairman was a “Jewish ISIS”. "Liberman's remarks on the 'cutting off the heads' of Israeli Arabs requires an investigation," Tibi said in a speech at the University of Jenin. He further pledged that the Joint Arab List on which he is running for the Knesset will "will remove racists' and fascists' heads only through democratic means. The stronger we are, the weaker the Jewish Islamic State will be." Tibi, who was placed in the #4 spot on the Joint Arab List, has on numerous occasions used his position as an Israeli parliamentarian to take anti-Israel actions. Last year, he said the Hamas terror group in Gaza is "not a terror organization," just shortly before it launched a terror war on Israel causing Operation Protective Edge, and amid the abduction and murder of three Israeli teens Naftali Frenkel, Eyal Yifrah and Gilad Sha'ar hy''d by Hamas terrorists. Regarding those terrorists who murdered the three Israeli teens, Tibi likewise refused to call them terrorists. He has in the past praised the Palestinian Authority’s “martyrs” at a ceremony held on the occasion of "Palestinian Martyrs Day” and sponsored by Palestinian Authority chairman Mahmoud Abbas. In January, after the Arab parties decided to run on a joint list in order to maintain their power despite the raising of the electoral threshold, Tibi mocked Liberman, who had initiated the law raising the threshold. "Liberman and the extreme rightists raised the threshold to push the Arabs out of the Knesset. Today we are closer to the top and closer to the threshold, and we hope that [Liberman] will not have a representative in the Knesset. Our list has no theft suspects like Liberman's party does - this list is clean and pure,” he said at the time.